They are absolutely adorable. I love the images, so cute. The sentiment on the bag is perfect. They will love these. OMG Sherrie, these are adorable! I LOVE the sentiment on the little brown paper packages! Oh, they are the sweetest cards, Sherrie!! I love the crazy birds!! You've colored them beautifully!! The faces on the suns are so cute!! They totally make me smile!! The embossing is such a fabulous touch!! And the goodie bags are awesome!! What wonderful gifts these are!! They will be treasured!! Thank you so much for linking up at DL.ART!! 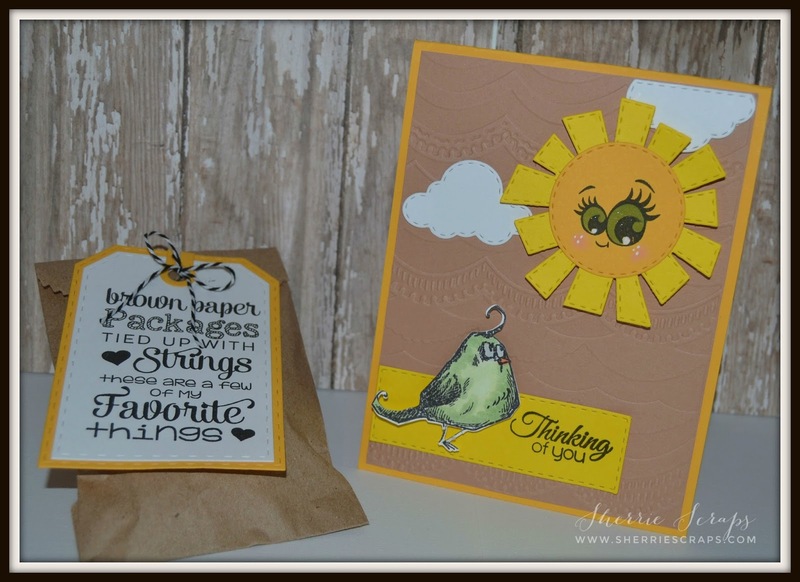 Your cards are adorable and I just love those little treat bags with the sentiments attached to them! Loving the embossing you did too, these will be fabulous gifts! Those cards are adorable Sherrie! & I LOVE that sweet packaging too! What a great way to say your thinking of someone! Your always so sweet to put a smile on someones face! :0 Have a great day! These are simply AWESOME!!!!!!!!!! LOVE LOVE LOVE the sun and the birds!!!!!!!!! And I got my happy mail yesterday!!!!!!!! Ohhhhhhhhh I was so happy and surprised! THANK YOU soooooooo much! You made my day!!!!!!!!!!!!!!! These are soooo much fun and full of wonderful Sherrie ! Adore these my friend ! Oh my goodness these are absolutely so adorable!!! I love the little crazy birds... and the cute sunshine! Your paper brown bags are so cute! And how sweet of you to give away some little goodies and a card just because... that would make anyone's day... you sure are a sweet friend and I'm blessed that I can call you mine! Oh my goodness..who would not smile over these cutie patooties! !I love the super cute sun with the PKS! !The TH birdies are just adorable! !The special packaging JB stamp set is AWESOME! I really like that!! Super fun tag and such a wonderful treat as well!! You are SUPER sweet my friend!! The recipient will love this!! these are so so cute Sherrie!! Love the fun Peachy Keen faces you used. Oh Sherrie these are so cute! Whoever gets them will love them for sure! I love those bird stamps, I have almost bought them a few times. How adorable! That song is one of my favorites because my mom used to sing it around my house all of the time! Just so cute! 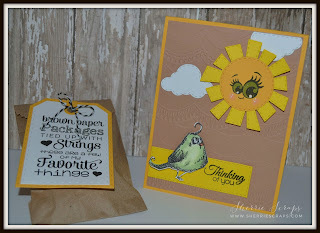 Such fun and cheerful cards Sherrie! 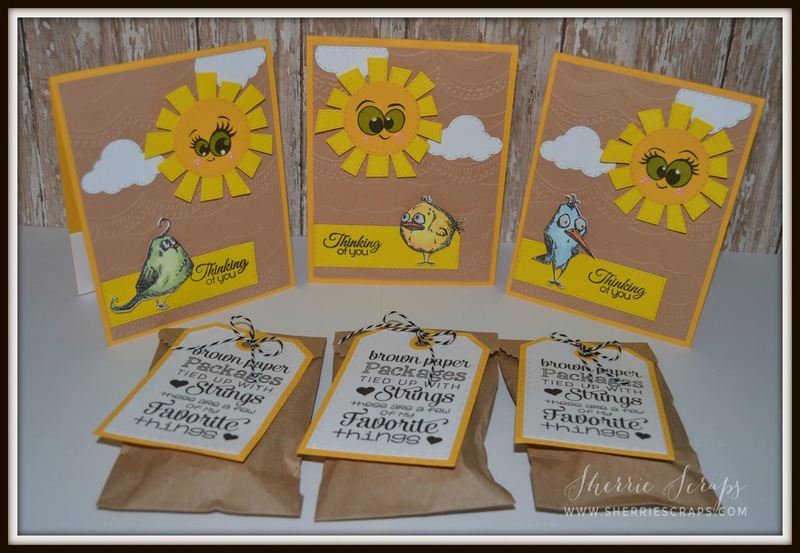 Love the variety of expressions on the sunshine and the fun birds! Hope you have a great day! Aw what an adorable set!! thanks for joining us in the Jaded Blossom Challenge! such a cute set ! love the brown packages and the embossing details on the cards ! Thanks so much for joining us in the Jaded Blossom challenge this month ! Super cute! So glad you joined us at Jaded Blossom for the August Challenge! These are wonderful!!! What a lovely surprise for your crafty friends! I love the sentiment on the luggage tags too. The Sound of Music is one of my all-time favourites.